BURBANK, Calif. – August 9, 2018 – 2018 is a big year for Mickey Mouse, who celebrates his 90th anniversary this year, and D23: The Official Disney Fan Club is bringing the celebration to the pages of the fall issue of Disney twenty-three. Film historian Leonard Maltin honors Mickey’s enduring optimism and youthful spirit. Celebrities and luminaries including Kurt Russell, Mark Hamill, Whoopi Goldberg, Alan Menken and Hayley Mills recall their fondest Mickey memories. 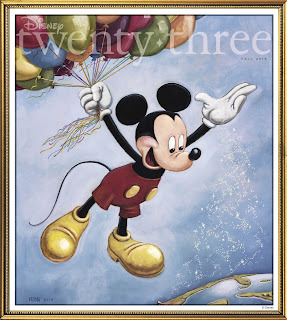 The cover features the latest tribute to Mickey—his new birthday portrait, titled Spreading Magic Around the World, painted by legendary Walt Disney Animation Studios animator Mark Henn—and Walt Disney Archives director Becky Cline looks at the long-standing tradition of Mickey portraits over the decades.